Today is World AIDS Day, and I cannot forget. For many years, I have honored this date as the day I would recount those I had loved and lost. For one friend in particular this date has held deep and lasting significance for me. I never knew the exact date that my friend Carlos died. So, for me, December 1 became the date that I remembered and honored this treasured, beloved friend who was and is an inextricable part of my faith and life journey. On December 1st, I would find myself driving somewhere…volume cranked up on the CD player in my car…singing the soundtrack to “Rent” at the top of my lungs. Tears would stream down my face, especially when the cast sang, “Will I lose my dignity…will someone care…” I wish I could guarantee that, for my own friend and for all people who suffer and struggle and live in the face of death and grief and loss. What we cannot guarantee often becomes a prayer. My prayers, each year, were sung at the top of my lungs. Although many of my remembrances have been private over the years, in 2011 I was offered an opportunity to publicly remember. By then, I had lost yet another beloved family member and friend who had dedicated his life and career to dignity and strength for those living with AIDS. 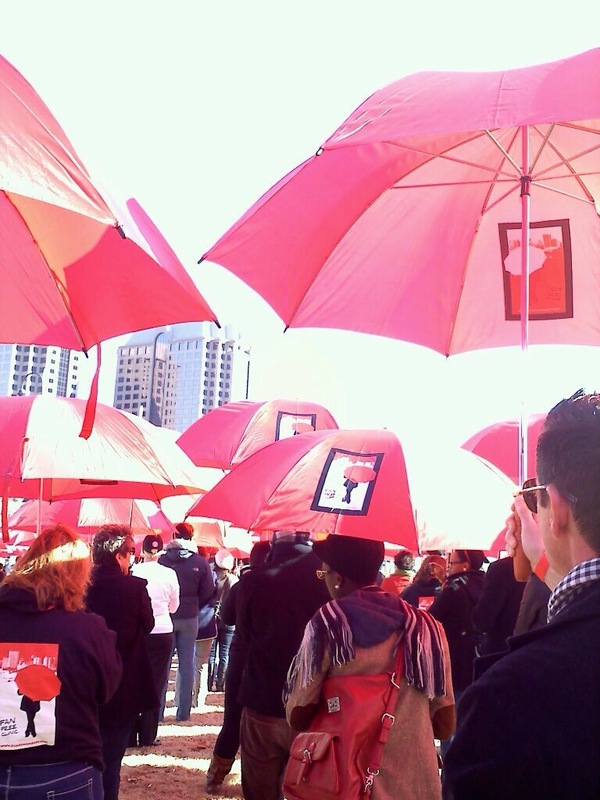 The organization he worked for, Fan Free Clinic, staged an event where hundreds of red umbrellas were held overhead, forming a red ribbon that could be seen from miles. We stood in formation for 7.5 minutes…the symbolic length of time in which someone each day is diagnosed with HIV in the United States. I remembered Laird laughing hysterically at our irreverent but beautiful rendition of a “gay nativity” the first Christmas we shared together. I remembered crying with him in a hospital bed, cursing the frustration that losing one’s immunity creates when trying so hard to rehabilitate. I remembered my tenor friend Michael’s hugs at the passing of the peace each Sunday we sang in choir together, feeling the thinness of his body growing more and more noticeable. I remember his partner passing out bubbles at his funeral, begging us to blow bubbles in all our favorite places to keep Michael’s spirit alive in those spaces of beauty and hope (I still do). I remember letters from Carlos filling my mailbox at college, signed with his name and a doodled rose, his trademark signature. I remember the last phone call, and the last letter. I regret that I lost it, and confess that I still search for it from time to time, wishing for one more rose. I remember vibrant Gabe with whom I laughed away lunch hours until suddenly, there were no more. I remember the hands of patients and clients I have held, and the eyes I have looked into saying: I care. You have dignity. You are loved. I remember the vivid dreams and visions where I have reconnected for fleeting moments with these gentle, loving souls who graced my life with their presence. Yes, I remembered all these as I stood with my umbrella. It was 7.5 minutes of deep connection that I still treasure. I remember these beloved friends again today. This advent, I take in these memories as a prayer, asking for these memories to become part of my formation, my narrative, the divine preparation for a continued commitment in service to dignity, justice, and worth for every human being. Memory becomes incarnate, and dwells with me. This entry was posted in Advent 2014 and tagged adventword, AIDS, Grief, HIV, memory, remember, remembrance, world AIDS day. Bookmark the permalink.